I'm not sure how to write this post or even if I should be writing it. I hope you don't all think me shameless. I can't help it really. 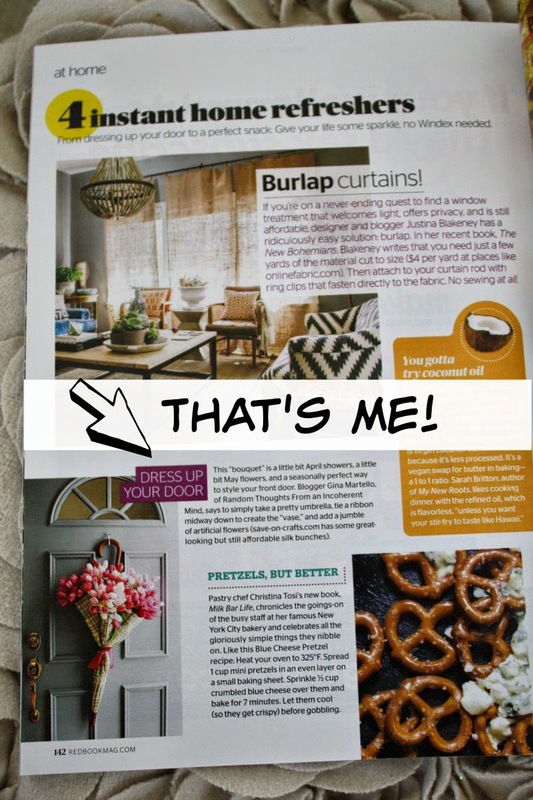 I was contacted by the Home Editor of Redbook magazine.
" Are you talking to lil' old me?" Yes, of course you can feature it! the whole thing didn't work out. I was pleasantly surprised to find myself on page 142. 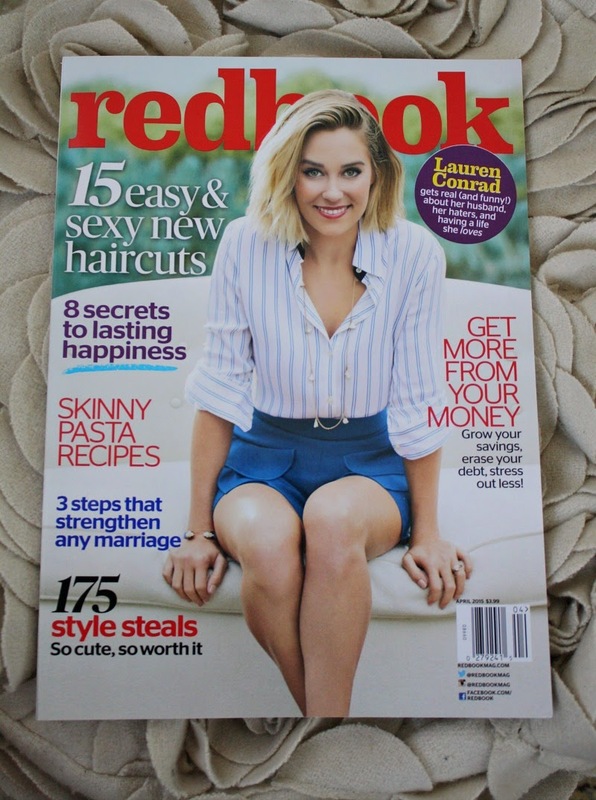 Many thanks to Redbook Magazine. I am both honored & excited to be featured in their publication. I'll be back to share some Spring decor soon. That's awesome, Gina! Congratulations! :) It is very pretty! CONGRATS Gina...that's wonderful!! So happy for you...that umbrella looks awesome! What!! What!! What!! How exciting! How did you keep this little secret!! Found that is a new word for Umbrella. Bravo to the editor that recognized your talent, Gina! To think that those of us that visit you were the very first to see your beautiful spring door. It's both a delight and an honor to see it once again, in print! GINA!! That is so exciting!! That is the cutest umbrella I have ever seen and it looks awesome against the colored door! You must have been sooo excited! Have a wonderful day my friend! Well girl, you know or at least you should know that you are the queen of vignettes!! This is sooooo beautiful that of course they would run with it!! Congrats! That is exciting. I love your umbrella. Congratulations on an honor well deserved! Your door decor is beautiful and really should have been on the cover. Great job! Awwww! That is so cool! Toot that horn girl! I'd be shouting it from the roof tops LOL! Congratulations! Oh, yes, yes, yes! 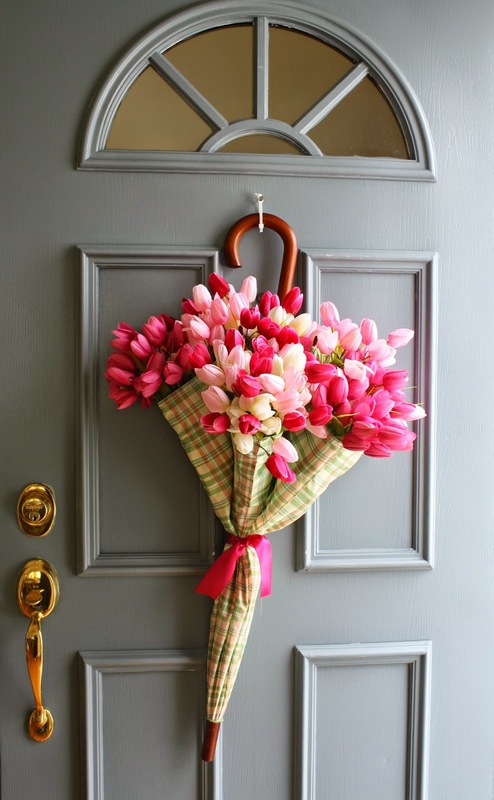 Your awesome umbrella door craft sooooo deserves this - it is totally magazine worthy, sweet lady! CONGRATS!!!! Oh Gina...How wonderful!! I am so happy for you. You deserve to be in every magazine, your projects are always unique and special. I have no idea how I missed this, I even checked that I was still following you and yep I was....I hate missing your posts! That's impressive. Congratulations to you! Oh my gosh, Gina! Congratulations for your feature. That is soooo exciting and I'm so happy for you. Way to go!! Yay!!!! How exciting Gina. Congratulations.